We are on holidays, in the loving embrace of my family. I am treading water emotionally as I had anxiety about how I would manage face to face interactions given my journey this year and being separated from my network of support has made me uncomfortable. But so far, so good. 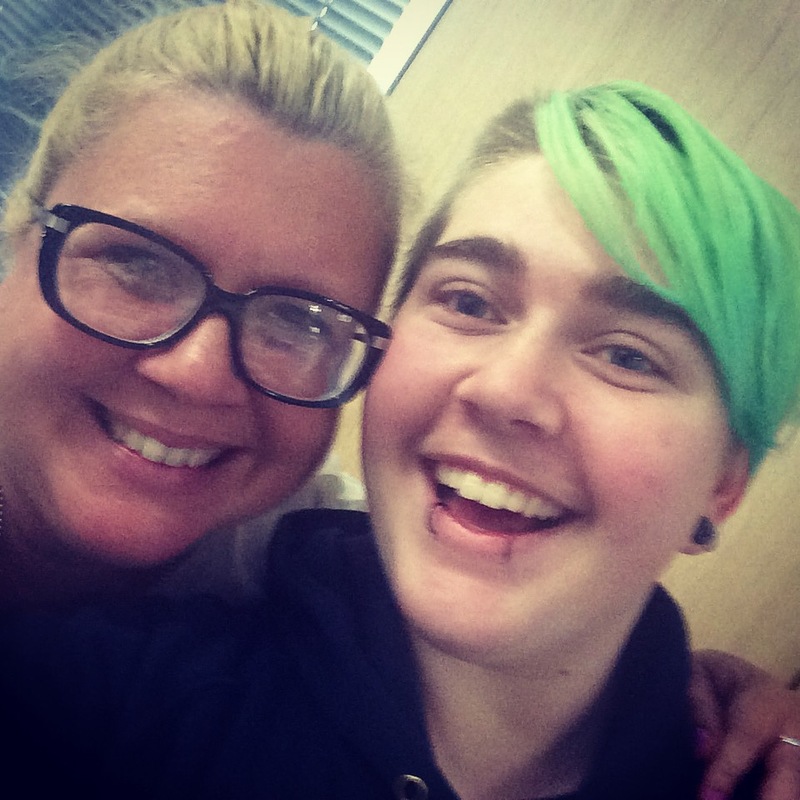 Our journey to Queensland was joyful, lots of love and support for my blue haired baby and wonderfully restorative for me, the opportunity to be face to face with valued friends and talk about next year made me realise that near or far my safety net is strong. Jeremy has been strengthened by so many positive interactions with family and friends including a second dinner with his dad. Each time that happens it gives him more reason to stay positive, to reject the voice in his head that whispers bad things to him. It is more reason to get up each morning. Merry Christmas – may your gifts be ones of love and demonstrate the value that the giver places on your relationship. Jeremy and I will have you in our prayers. Another year has passed. Myself and my family have grown, and we have learned many new lessons. This year is my last year before I medically transition, five more months until I’m 18! It’s going to be tough, I think, adjusting to the hormones, but this is just another stretch in my long journey. I know that whatever happens with me, my mum will always be there to support me and love me. I don’t think I’ve ever met a person more lucky than me to have a humyn like her in their lives. December is a time for family. Even as I type, mum, Luke, and I are heading towards Canberra on our three day trip to Brisbane to see aunties, uncles, cousins, and grandparents to celebrate our love for one another. I am lucky to have a family that has loved me through my journey, and I will always say to those who feel as if they have no family this year, you will always have me. I would also like to thank everyone that stays with this blog and has read along with our journey. I have always seen how cathartic writing for this blog has been for mum, and it has allowed us to discuss and learn from each other through a time where communication is integral. Your viewership and the help it has brought to her and our readers is what keeps us going through everything. So thank you. You all hold a special place in my heart. Please everyone stay safe, have a wonderful holiday season. I love “Call the Midwife”, a beautiful BBC series about midwives in London in the 50’s at the advent of the NHS and in the middle of the baby boom. Watching a Christmas special these words from an elderly character made me catch my breath as she recalled dark days in the workhouse “She had bones as fragile as a birds. The wardress brought her to me one night on account of the noise, she had chilblains, I wrapped her in my petticoat and held her all night. They took her away in the morning, I never saw her again. I had too many, I knew when they stopped singing”. I can hear the anxiety in J’s voice on occasion. A legacy of childhood he can still react from a very primal position when he tries to balance multiple priorities. It is countered with a “dude, chill” from me when I am around. Lockie has a similar strategy to manage the anxiety that gets directed at him by J. Jeremy’s depression however is a distant memory. For that I am profoundly grateful. My child two years ago was a bundle of defensive anger and anxiety, careless with possessions, rude and aggressive. We were at the end of six months of my being at home fully supporting him and his activities. I was wondering why the heck I had bothered as I felt I hadn’t made a difference. I was stressed and broke and feeling hopeless as a parent and a provider. Last night J had a number of friends stay over, Lockie and Titan were here too, so I got my fill of puppy cuddles. I got to put faces to the names that I hear all the time. J baked up a storm and cooked a fabulous roast dinner. He and his friends watched movies, ate food and hung out. We had pancake brunch and the dishwasher has been going all day, but J was so relaxed, happy and every inch the young man. Next week marks two years since I introduced my son to the world. It was a low key, tentative step. I was anxious, confused and angry at God and a world that gave my baby this difficult path. Our next year will be characterised by physical transformation for J as he commences cross hormone therapy. I have often spoken about the delay in J being able to access the next stage of treatment as a gift to him so he can take the time to adjust. So it has been for me as well. 2014 has been in some ways my own annus horrendum in terms of relationships and finances. I stood at the edge of transformation and stepped off the ledge into the unknown to find that old hurts and pains could be healed. I am a different person to the momma of a year ago and two years ago. J has been vocal in his support of my transformation and I treasure his support. I am looking to 2015 as a year of professional successes and positive action. Woven into this will be J’s physical changes and Year 12 studies. It will be challenging however this year of space has helped me so much in terms of getting my head around the next stage of J’s journey. So I think for J 2015 will be when he finds his voice. It will be a new voice for my ears but one that I will love as dearly and the beloved voice I know so well. I am ready for this next step.